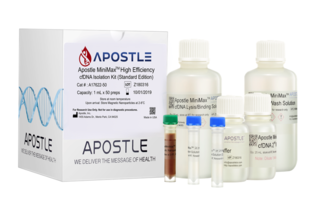 Indianapolis, USA (February 28, 2019) – Today, at the Advances in Genome Biology and Technology (AGBT) General Meeting,* Beckman Coulter Life Sciences announces the launch of Apostle MiniMaxTM High Efficiency Cell-Free DNA Isolation Kit through an exclusive partnership with Apostle, a liquid biopsy company. As cfDNA workflows move beyond theoretical and into human health applications, Apostle's industry-leading chemistry paired with Beckman Coulter Life Sciences’ portfolio of genomic reagents and liquid handling platforms enables researchers to meet the growing demands for sequencing of tumor-derived cfDNA. “We have listened to their ongoing challenges in working with cfDNA and sought to find ways to effectively combat those issues. This includes recognizing that an innovative product from a startup like Apostle is the best technology to address these needs." For more information on Apostle MiniMaxTM High Efficiency Cell-Free DNA Isolation Kit, please visit www.beckman.com/apostle-minimax. Beckman Coulter Life Sciences develops, manufactures and markets products that simplify, automate and innovate complex biomedical testing. For more than 75 years, our products have been making a difference in people’s lives by improving the productivity of medical professionals and scientists, supplying critical information for improving patient health and delivering trusted solutions for research and discovery. Scientists use our life science research instruments to study complex biological problems including causes of disease and potential new therapies or drugs. For more information, visit beckman.com. Apostle Inc. is a biotechnology company in Menlo Park, CA. Apostle focuses on research, development, licensing, and sales of novel technologies, and the related intellectual properties, products, and services for diagnosis and treatment of human diseases. Apostle is dedicated to fundamentally improving the accuracy and efficiency of liquid biopsy—the testing of circulating free DNA (cfDNA)—in early cancer detection or other clinical applications such as noninvasive prenatal testing (NIPT) and tests for infectious diseases. * The Advances in Genome Biology and Technology (AGBT) General Meeting is being held in Marco Island, Florida, USA, from February 27 to March 2, 2019.